Agricultural tow ball (50mm) with 3/4" (19mm) thread dia. to fit agricultural linkage drawbars. NOT for use on Australian Road Vehicles. 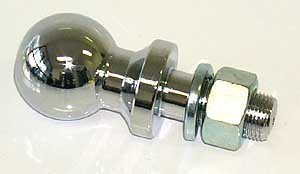 B92430 Chrome Plated 1 7/8" (47.6mm) ball with 3/4 " (19mm) thread dia . Fits JD Farm Equipment NOT for use on Australian Road Vehicles. 1 7/8" (47.6mm) ball with 3/4 " (19mm) thread dia .